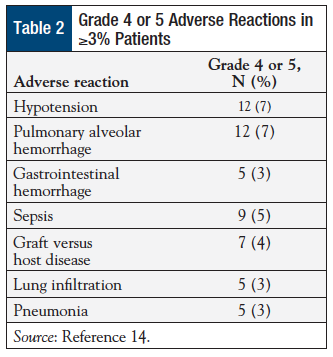 The approval of defibrotide sodium for the treatment of adults and children with hepatic VOD and renal or pulmonary dysfunction after undergoing HSCT was based on the results of 3 clinical trials.14-17 Survival rates reported with defibrotide sodium in the 3 studies are outlined in Table 1. In the first study, a phase 3, prospective clinical trial, investigators evaluated the efficacy and safety of defibrotide sodium in 134 patients with hepatic VOD and multiorgan failure.14,15 Patients in the treatment group (N = 102) received defibrotide sodium 25 mg daily, and the control group (N = 32) comprised historical-control patients who underwent HSCT and were identified from 6867 medical charts. Defibrotide sodium is distributed through McKesson Plasma and Biologics. Institutions should verify they have a contract with this distributor or set up a contract before ordering the drug, according to the drug manufacturer (https://defitelio.com). Defibrotide sodium is the first treatment to receive FDA approval in the United States for patients with severe hepatic VOD, a rare but life-threatening condition occurring in patients who receive chemotherapy after HSCT. Evidence from 3 clinical trials shows that this new medication is generally safe and well-tolerated, and is an effective treatment option for patients with hepatic VOD associated with renal or with pulmonary dysfunction after HSCT. Kotecha RS, Buckland A, Phillips MB, et al. Hepatic sinusoidal obstruction syndrome during chemotherapy for childhood medulloblastoma: report of a case and review of the literature. J Pediatr Hematol Oncol. 2014;36:76-80. Coppell JA, Richardson PG, Soiffer R, et al. Hepatic veno-occlusive disease following stem cell transplantation: incidence, clinical course, and outcome. Biol Blood Marrow Transplant. 2010;16:157-168. Bearman SI. The syndrome of hepatic veno-occlusive disease after marrow transplantation. Blood. 1995;85:3005-3020. Carreras E, Bertz H, Arcese W, et al. Incidence and outcome of hepatic veno-occlusive disease after blood or marrow transplantation: a prospective cohort study of the Group for Blood and Marrow Transplantation. European Group for Blood and Marrow Transplantation Chronic Leukemia Working Party. Blood. 1998;92:3599-3604. Richardson P, Guinan E. The pathology, diagnosis, and treatment of hepatic veno-occlusive disease: current status and novel approaches. Br J Haematol. 1999;107:485-493. McDonald GB, Hinds MS, Fisher LD, et al. Veno-occlusive disease of the liver and multiorgan failure after bone marrow transplantation: a cohort study of 355 patients. Ann Intern Med. 1993; 118:255-267. Bearman SI, Anderson GL, Mori M, et al. Veno-occlusive disease of the liver: development of a model for predicting fatal outcome after marrow transplantation. J Clin Oncol. 1993;11:1729-1736. US Food and Drug Administration. FDA approves first treatment for rare disease in patients who receive stem cell transplantation from blood or bone marrow. www.fda.gov/NewsEvents/Newsroom/PressAnnouncements/ucm493225.htm. Published March 30, 2016. Accessed May 31, 2016. Harper JL, Willert JR. Veno-occlusive hepatic disease treatment & management. http://emedicine.medscape.com/article/989167-treatment. Updated March 31, 2016. Accessed April 19, 2016. Kulkarni S, Rodriguez M, Lafuente A, et al. Recombinant tissue plasminogen activator (rtPA) for the treatment of hepatic veno-occlusive disease (VOD). Bone Marrow Transplant. 1999;23:803-807. Bearman SI, Lee JL, Barón AE, McDonald GB. Treatment of hepatic venocclusive disease with recombinant human tissue plasminogen activator and heparin in 42 marrow transplant patients. Blood. 1997;89:1501-1506. Bajwa RP, Cant AJ, Abinun M, et al. Recombinant tissue plasminogen activator for treatment of hepatic veno-occlusive disease following bone marrow transplantation in children: effectiveness and a scoring system for initiating treatment. Bone Marrow Transplant. 2003;31:591-597. Baglin TP, Harper P, Marcus RE. Veno-occlusive disease of the liver complicating ABMT successfully treated with recombinant tissue plasminogen activator (rt-PA). Bone Marrow Transplant. 1990;5:439-441. Defitelio (defibrotide sodium) [package insert]. Palo Alto, CA: Jazz Pharmaceuticals; 2016. Richardson PG, Riches ML, Kernan NA, et al. Phase 3 trial of defibrotide for the treatment of severe veno-occlusive disease and multi-organ failure. Blood. 2016;127:1656-1665. Richardson PG, Soiffer RJ, Antin JH, et al. Defibrotide for the treatment of severe hepatic veno-occlusive disease and multiorgan failure after stem cell transplantation: a multicenter, randomized, dose-finding trial. Biol Blood Marrow Transplant. 2010;16:1005-1017. Richardson PG, Smith AR, Triplett BM, et al. Early initiation of defibrotide in patients with hepatic venoocclusive disease/sinusoidal obstruction syndrome following hematopoietic stem cell transplantation improves day +100 survival. Presented at the American Society of Hematology 57th Annual Meeting; December 5-8, 2015; Orlando, Florida.